The Halloween decorations are down and most of the good candy is gone, and so the smell of thanksgiving turkey can’t be far behind. Which brings us around to stuffing. Not just any stuffing, but the kind legends are written about, the kind kids ask their grandparents to tell them stories about… the kind you’d rather fight for than share. Our Potato Rosemary Loaf was made for stuffing – it was also made for all those other great bready things, but stuffing may be its true calling. 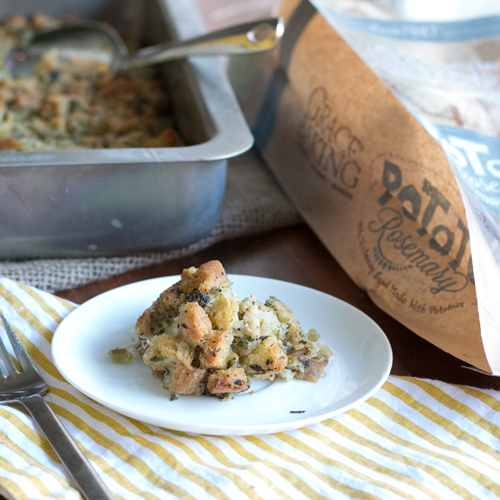 Stuffing done our way is an irresistible fusion of Grace Baking goodness, herbs & spices, butter, onions, eggs and holiday cheer. How you fit that last ingredient in is up to you, but it’ll be in every bite. Preheat oven to 250°F. Place cubed bread on a baking sheet and bake, stirring occasionally, until dried out (approximately 45 minutes). Transfer to a large bowl and set aside. Increase oven temperature to 350°F and spray a 9-by-13-inch pan or 3-quart baking dish with cooking spray. Set aside. In a large skillet, add ¾ cup of butter and melt over medium-high heat. Add the onions and celery and cook, stirring frequently, until vegetables have softened and are just beginning to lightly brown (approximately 10 minutes). Transfer to bowl with bread. Add parsley, sage, rosemary, thyme, salt, pepper and 1¼ cups of chicken broth to bowl and toss well to combine. Set aside. Whisk the remaining 1¼ cups of chicken broth with 2 eggs in a small mixing bowl. Once blended, pour mixture over bread in large bowl and toss well to thoroughly coat. Transfer mixture to prepared baking dish. Dice remaining ¼ cup butter into 8–10 pieces and arrange evenly over the top of the stuffing. Cover with foil and bake for 40 minutes. Uncover and bake an additional 40 to 45 minutes, or until top is golden brown. Serve immediately. * Tip: To save cooking time, cut up bread the night before, place in a bowl and leave uncovered on counter overnight.